"He used to always say, 'If you're ever in trouble, even if I've got men around me, just give me the ball and I'll get you out of trouble.'" For some, the question about which midfielder was better, Paul Scholes, Steven Gerrard or Frank Lampard, is bound to raise a smile or a shake of the head. The debate is somewhat flawed because Roy Keane was better than the three of them. The Irishman is the best midfielder the Premier League has seen. He wasn't as gifted as Scholes, as athletic as Gerrard and didn't score as many goals as Lampard. But this trio of Premier League legends couldn't control a game like Keane. None of them had the impact on their teams, or English football, the way Keane had at Manchester United for just over 12 years. He was the most important player for one of the world's biggest clubs during their most successful era. However, Keane's personality and reputation, the anecdotes and the caricature, have almost overshadowed how he ascended to the peak of the sport and his achievements. When he was 18, Keane was on the dole in Cork, overlooked by English clubs because of his height and about to sign for Cobh Ramblers in the second tier of Irish football. When he was 28, he was the best and most important player in English football, United's captain, the best-paid player in the Premier League and the best midfielder in the world. He won seven Premier League titles, four FA Cups and the Champions League (despite missing the final through suspension). He was also named PFA Player of the Year and in the association's Team of the Century. He dragged the Republic of Ireland to the 2002 World Cup and United to the 1999 Champions League final. 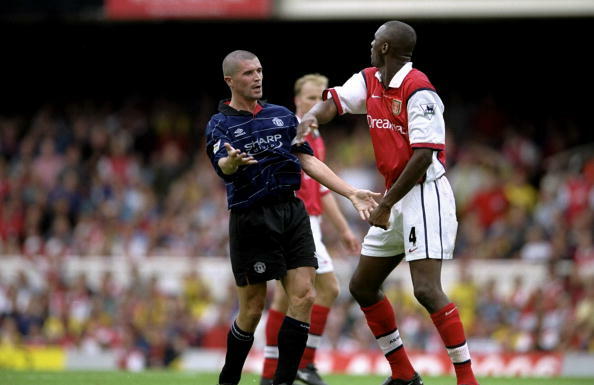 Yet, any mention of Roy Keane the footballer is likely to be met with references to his tunnel dispute with Patrick Vieira, or his horror tackle on Alf-Inge Haaland, or how he put the fear of god into his teammates and the opposition. Keane's passing ability is rarely mentioned, and that is almost criminal. In addition to his fierce intelligence, his limitless energy and his exceptional positional sense, the Irishman's passing was world class. Wayne Rooney said Keane was the best passer of the ball he ever played alongside. Rooney played alongside Scholes for nine years at Old Trafford, and with Gerrard and Lampard for 11 years for England, yet just one full season alongside Keane was enough to convince him of his excellence on the ball. Darren Fletcher said his former captain had the best first touch he ever saw. Fletcher's claim is equally impressive considering the incredible footballers he played alongside and against. As Rio Ferdinand can attest, Keane passed the ball forward. "And then I realised that you've got to take chances and that's how I ended up playing my career. Not just passing the simple ball to Gary, but into the strikers to make a difference." As Gary Neville spoke about in his autobiography, Keane was extremely efficient in possession and expected the ball to be moved quickly. "It was like having a snarling pitbull in my face. And I’d thought Schmeichel was a hard taskmaster. One extra touch and Keano was slaughtering me." Keane demanded these standards of others, but he also practised what he preached. He didn't play Hollywood balls, raking cross-field passes that looked good, but weren't always effective because they gave the opposition time to shift across and stifle out the attack. 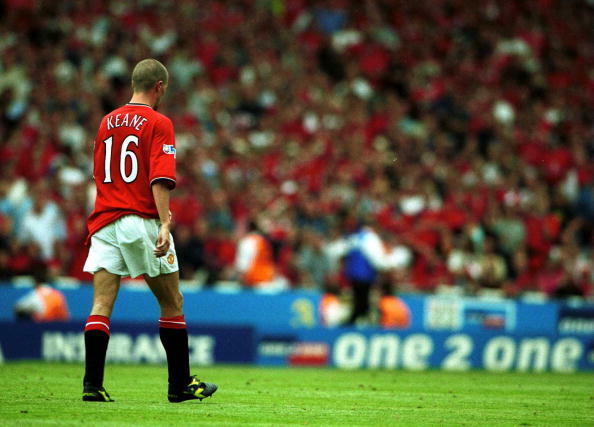 Keane's passes were so effective because they broke the lines, and he always played the ball into teammates' feet. He enabled Scholes to play further forward, brought United's strikers into play and the team sprang into life when he came into possession, with David Beckham and Ryan Giggs running off him and the full-backs pushing on. When Keane was on the ball, United were safe. He kept it simple, taking one touch to control and another to play a sharp ball to his teammates. He landed the ball at their feet and rarely hit a loose pass. 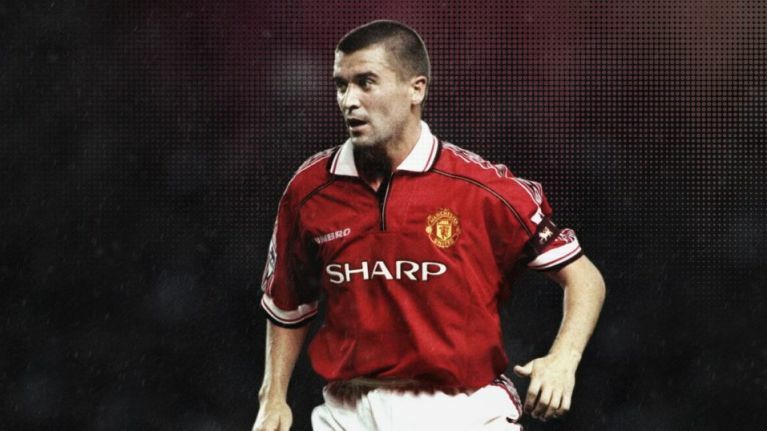 In the late 1990s, when United were the most thrilling counter-attacking side in Europe, Keane's passing was vital in getting the team up the pitch and into areas where they could hurt the opposition. He also drove forward from midfield in his early years. In his first couple of seasons, he played as a traditional box-to-box midfielder who got his fair share of goals. Gradually he adapted to become more of a controlling presence in midfield, winning the ball and starting attacks rather than running beyond the opposition. United became more cautious in the early 2000s, switching from a 4-4-2 formation to playing a lone striker, and Keane himself slowed down. After a hip operation in 2002, he could no longer be the driving force from midfield he had been. His intensity dipped a level or two on the pitch and he adapted his game somewhat, but his passing remained impeccable and helped United control games. His influence remained as strong, despite his advancing years. No touch was wasted, the ball never went sideways or backwards for the sake of it and it was never aimlessly lumped towards a forward's head. He was precise, efficient and effective. The complete midfield player. There is absolutely nothing flashy about any of these passes, and they aren't aesthetically eye-catching, but their effectiveness can't be understated and they would have been greatly appreciated by teammates. "His touch was immaculate, he had the best first touch. All these things were so underrated in his game," Fletcher said about Keane a few years ago. "Everyone looked at him as this ferocious competitor and box-to-box runner and tackler. That wasn’t false, but, with the ball, he had one of the best first touches and the best pass forward into the attacking half to break the lines of the opposition that I’ve ever seen... Because Roy controlled the midfield, Scholesy was then the one who got forward and got goals and used his technique higher up the pitch." Keane's ability on the ball has been called "underrated" by Neville, who said his former captain used the ball "astutely." "But perhaps his greatest gift was to create a standard of performance which demanded the very best from his team. You would look at him busting a gut and feel that you’d be betraying him if you didn’t give everything yourself." 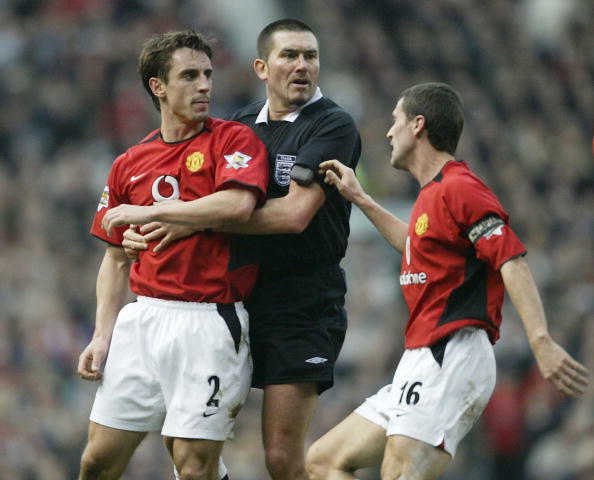 Keane's excellent passing contributed to this "standard of performance" that Neville spoke about. According to Phil Neville, the Irishman told him that, "If you're ever in trouble, even if I've got men around me, just give me the ball and I'll get you out of trouble."  This is the type of leadership that goes beyond barking at teammates or flying into tackles, or the traditional British and Irish ideals of what constitutes a leader on the pitch. It could be argued that this image of a leader, which Keane embodied, in part explains why his passing has been underrated by many. People remember him snapping into challenges and screaming at teammates, but the impressive passages of play aren't always recalled. A perfect example of this is Keane's performance against The Netherlands in 2001 when Ireland won 1-0 in Dublin on their way to qualifying for the World Cup. Everyone in Ireland remembers Keane's crunching tackle on Marc Overmars in the opening minute, seeing it as a defining moment of the game, a marker set down that showed it wouldn't be the Dutch team's day. Which is was, but Overmars still went on to play well, and Keane's contribution went way beyond that tackle. The Ireland captain played a massive part in creating Jason McAteer's goal, collecting the ball out wide, he forced his way past Mark van Bommel and drew a tackle from Jaap Stam before laying the ball off to Damien Duff. Duff then played it out wide to Steve Finnan, who found McAteer to score and set Ireland up for a place at the World Cup. The goal came about because of Keane driving the team forward, by taking responsibility as he did on countless occasions for United and Ireland. The bigger the game, the better Keane played. He was never rotated or rested by Alex Ferguson for the important matches. He played 79 times in the Champions League and only one appearance was as a substitute. Unlike the rest of United's talented team, Keane was indispensable. 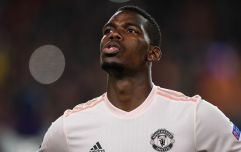 His explosive argument with Ferguson hastened his departure from Old Trafford in November 2005, rather than his declining ability on the field. 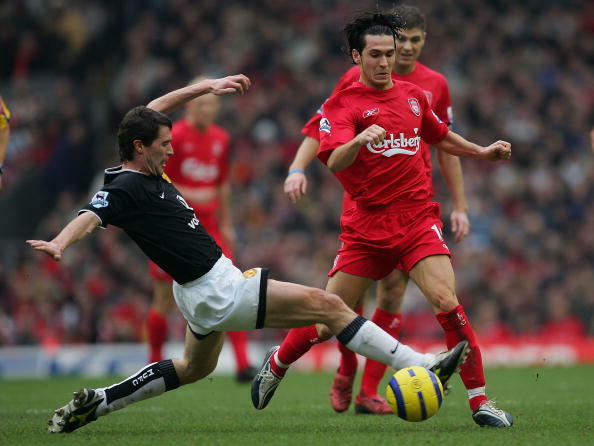 Keane wasn't the player he had been a few years previously, but he was still capable of dominating a game, as evidenced by his display against Liverpool in January 2005. United won the game at Anfield 1-0, thanks to Wayne Rooney's goal, and their captain's performance proved pivotal. Olivier Kay, writing in The Times, said Gerrard "was in Keane's shadow throughout", called the Irishman's performance a "masterclass" and a "lesson in how to control midfield." Gerrard was entering the peak years of his career, but the Liverpool captain couldn't get near the 33-year-old Irishman who would be retired within 18-months. 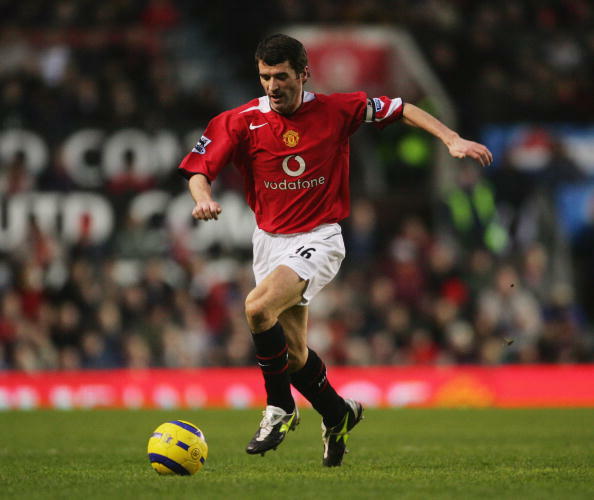 Against one of the best midfielders in the world, after several injuries and a hip-operation, in the winter of his career and at the most hostile ground in Britain for United, Keane ran the game. Keane's mythical status has grown since he retired, thanks to the anecdotes and autobiographies, and this caricature has arguably overshadowed his ability as a footballer. By always showing for the ball, using it efficiently and effectively, and bringing the best out of his teammates, he led by example. Shouting and screaming, and being excessively demanding of your teammates, will only get you so far. 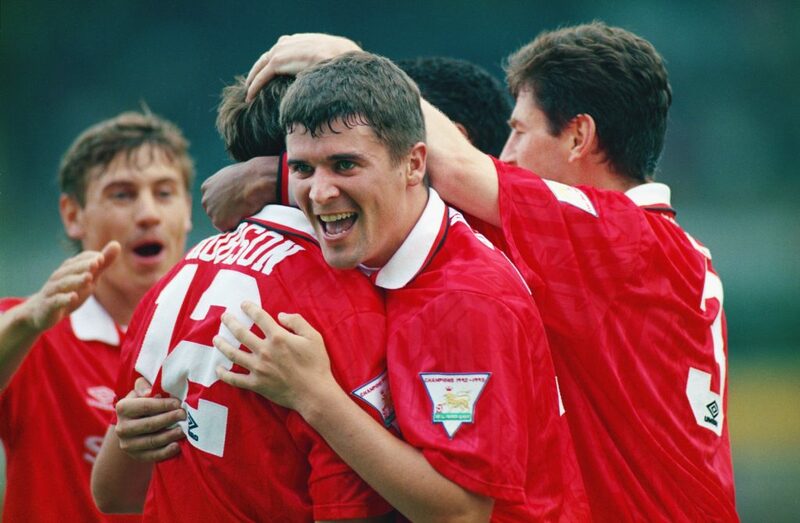 You need to be able to play, and Keane was one of the best. Underpinning his intensity and drive, his ferocious competitive spirit and his aggression, was a brilliant, intelligent footballer. 12 years after he retired, Keane remains the best midfielder the Premier League has seen.